Mmmm. Donuts. And other goodies. A must-install for finding duplicate files and cleaning house. Guess I can't avoid buying a Mac anymore. The Aperature "Light Table" function is worth it alone. 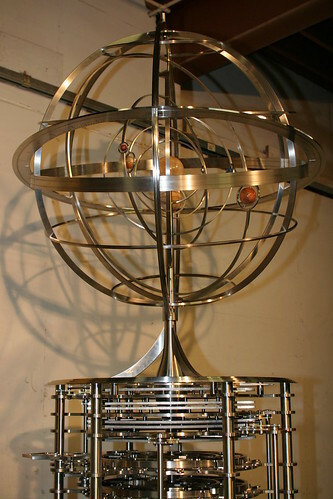 The Long Now Foundation has completed their second Orrey prototype. Long Now, Flickr page, and Discover article. I fear this web 2.0 stuff is getting out of hand. But this "gada.be" metasearch is pretty sweet. Excellent site to show unions of APIs. Worth moving to Asia for. Cornell Grand Challenge and their blog. Incredible puzzle boxes, by local woodworker Kagen Schaefer. "A Polarisation Activated Microlens comprising a high precision passive birefringent lens array and a commodity switchable polariser element is added to existing LCD panels with a low cost premium." Nice works of classic mechanics in Automata.